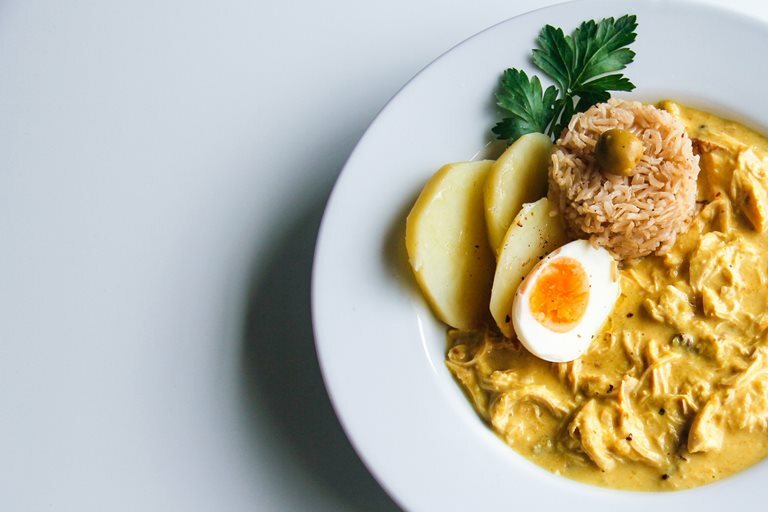 Rosana shares her Peruvian Creole Aji de Gallina recipe, a spicy, creamy, comforting chicken stew flavoured with aji Amarillo chillies. Some years ago, I took a sabbatical and went to Peru to visit some friends. Once there, I stayed in their houses and learnt to cook Peruvian food with their native mothers, sisters and aunties. It was a fabulous experience. Visiting and travelling around Peru in itself was an very special adventure which I highly recommend. Peruvian food has always been intriguing and vibrant. Many dishes are steeped in history and use delectable, exotic and local ingredients. Their fare is varied and divided by three regions; coastal with the most famous dish being ‘ceviche’, highlands (Andes) with the speciality being the ‘pachamanca’, which consists in a varied of meat cuts wrapped and cooked in a hole on the ground and the jungle (Amazon) with the traditional ‘juanes’, rice and chicken wrapped and cooked in banana leaves, river fish dishes and exotic tropical fruits. Throughout Peru there’s a large number of Chifas (Chinese/Peruvian) and Nikkei (Japanese/Peruvian) fusion food. When I came back to London, I continued to learn to cook Peruvian food with my Peruvian friends and learnt where to source both fresh and dry produce in London. These days you can get a few ingredients over the internet. Lately, Peruvian food has taken centre stage in London. There are so many dishes I like but only a handful are known in the UK. 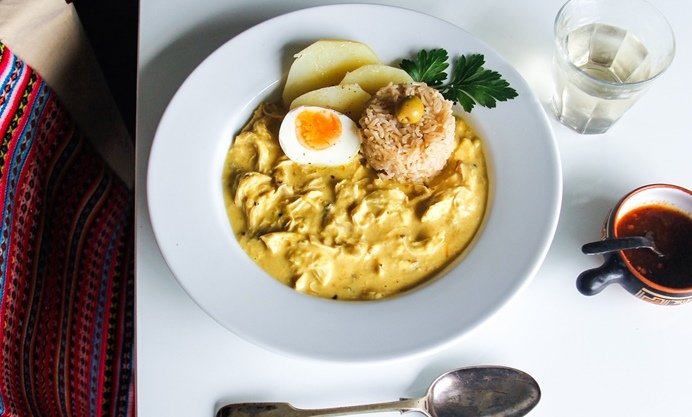 My favourite dish is a Peruvian classic, Aji de Gallina. A dish with roots in the French revolution. At that time, chefs working for the affluent families lost their jobs and some migrated to the new world. Wealthy Peruvian creole families employed them to show their wealth to the ruling Spaniards. This is a classic example of a fusion of European/French cooking techniques, available ingredients and local produce. I have a suspicion that over the years this recipe has been modified, for example the use of chicken instead of hen (gallina). The Peruvian table always has a pot of aji (chilli) to accompany the food. This dish reminds me of my lovely Peruvian adventure. Serve over the boiled rice and garnish with halved potatoes, boiled eggs in quarters and olives. This dish is even better the next day!